mom dating. holy man. anybody with me here? did you ever think you would still have to think about making friends when you were thirty? i know when i was in high school, i assumed i would have my group of people and that would be it. who would need more friends right? you’ve already got them. how naive my fifteen, sixteen, seventeen year old self was! can we just talk about trying to make new friends as an adult? and especially trying to make new friends as a mom with other moms? honestly it feels like a dating game. are her kids the same age? do they live within an hour of us? do we have the similar styles/morals of parenting? will our children even get along? do we have similar backgrounds, personalities, interests? occasionally i enjoy a glass of wine so any chance she drinks? does she even need another friend? whoa man. i mean it can be intense. now i’ve had my fair share of mom dating these past three years especially with moving and it hasn’t been easy. i’ve been on quite a few mom dates and then i never see said mom again. hey it happens right? you need to feel each other out, see if you click and if you don’t, that’s okay. some of the people i have had mom dates with though are people that have turned into incredible friends. the kind of friends who you wish you lived down the street from, can’t imagine them not in your life sort of friends. and i’m forever grateful. just like dating though, you’ve got to weed through the ones that aren’t right for you to get to the ones that are just perfect. and the best part is there are so many places to find moms. if you don’t know where to look for people who you could spark a conversation with, try these places. a workout class (assuming you saw said woman drop their child off in daycare center). even a children’s museum you can more often than not find moms with their kids there. i met one of my closest friends in a music class i had addison in when she was eleven months old. it took me five months to finally ask her if she’d ever be interested in a playdate but it worked out amazingly in the end. another close friend i met at a neighborhood park and when we were still talking well past dark, i asked for her number to get together and we got together every single week when i lived in alabama. and even though i don’t live close anymore, i still keep in contact with all my closest friends there. every mom feels this way whether you think she does or not, so if you ever feel a little silly asking for someone’s number or if they want to get together again, chances are they are feeling the exact same way. plus you don’t know what kind of person you’re missing out on if you don’t ask. all this to say, i want to encourage you to jump out of your comfort zone! ask the woman you’ve seen numerous times at the library to take the kids on a picnic one day or just meet at a park for an afternoon. if it doesn’t turn out that great, you can brush it off and move on since there’s nothing to lose but if it turns out great? it’s probably the greatest feeling ever when you know you’ve clicked with a new friend! Love this! 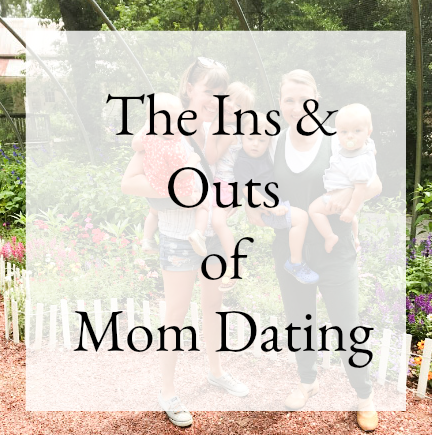 I only recently experienced mom dating when my oldest started school last year. And then I felt like I was "feeling out" all the moms to see who I had the most in common with and if their kids would mesh with mine etc. It is "work" but I have made some many mama friends that way and it's the best feeling having that tribe to support each other. This is great! I've had the hardest time making mom friends. We moved to a very rural area when my daughter was 2 months old. I joined the local MOPS group but never clicked with anyone. I guess I need to try harder! This is so great! Some of my favorite mom friends I met in the weirdest places! This is so true. All my mom friends have told me its like dating when it comes to making friends after babies. Sometimes friendships start in the weirdest places! Haha! Yes, so much truth! Mom dating is hard but so rewarding when you finally find a few moms to call your tribe!